When I heard that a novel written by a surrealist artist was being published in English for the first time, I knew I needed to read it. I was fascinated, both by the subject matter and the writer. 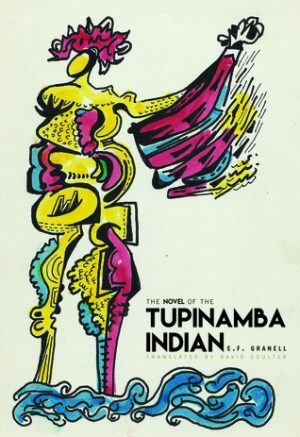 The Novel of the Tumpinamba Indian is a surrealist take on the Spanish Civil War and was written by E. F. Granell, artist and revolutionary. This novel is fascinating. There is a short section before the novel itself begins which speaks briefly about the Spanish Civil War and of Granell’s life and his role within the war. I really appreciated this section being included as the subject matter is something I’m not overly familiar with. The majority of the book is dedicated to the novel itself, however, weaving a surreal, otherworldly tale following several characters as they travel through a Spain torn apart by Civil War. The best was to explain the novel is, well, surreal. Not a little surreal, but very surreal. This is a world where things just sort of happen. People’s heads are cut off, but they live perfectly fine lives afterwards (at least sometimes). Other times they simply perish like the rest of us. Dogs can talk. Witches come over for tea. And everything is simply taken in stride. That sounds like magical realism, I hear you saying. And on a certain level I think that’s true. The real, the fantastical, and the absurd are woven together in this novel with deft precision. War time realities and fantastic elements are married quite well here. But when reading this book there is less internal ‘ah, look, fantasy!’ and more ‘what the hell is going on here’. The opening pages solidify this, and while it can be difficult to get into or follow at times, I think that it is ultimately entertaining and very much works. Honestly, I feel as if a few more readings are necessary. My knowledge of the Spanish Civil War is limited. It wasn’t something I studied much in school, nor was it something I’ve researched on my own. And while I appreciate surrealist art, my own art history degree was concentrated on the ancient world and archaeology, falling far outside the realms of modern and surrealist art. There are things that I know are important, scenes that make a statement, are bold, and mean something. Yet, the answer and deeper meanings remain murky to me. This is a hard book to give a start rating to, but an easy book to talk about. There are many elements I like about it. I like how the main characters, and the recurring characters do not have names. They are known only by their titles, whereas the majority of the other characters all have distinct names. The Indio Tumpinamba, the Priest, the Gypsy, the Conquistador – they are never known by anything more familiar than their titles. Many of the conversations between the characters are fascinating as well, whether characters are debating politics, societal issues, literature, etc. Overall, I liked these chapters best, chapters where the forward momentum of the plot stalled slightly and we simply get to sit and talk. Despite knowing that I need to reread this to truly appreciate what the author was trying to say, I did enjoy reading The Novel of the Tumpinamba Indian. The conversations between characters, the debates on topics such as politics, art, and literature are gripping. The marriage of the real, the historical, and the surreal is fascinating. This is a book I want to read again at some point, a book the deserves a deeper look than I’ve been able to provide. I don’t think this book is for everyone. Some may find it too surreal, too absurd, but that is also part of its beauty. So pick this book up. Spend some time with it. You might just find something fascinating here.